August’s sensational weather has proven delightful once again for our visitors at Martin Ranch Winery. With harvest just around the corner, there’s no better way to enjoy these last days of summer than with a tasting followed by a perfect picnic on our grounds. Today, we’re taking the guesswork out of coupling our wines with foods that guests to MRW frequently enjoy. 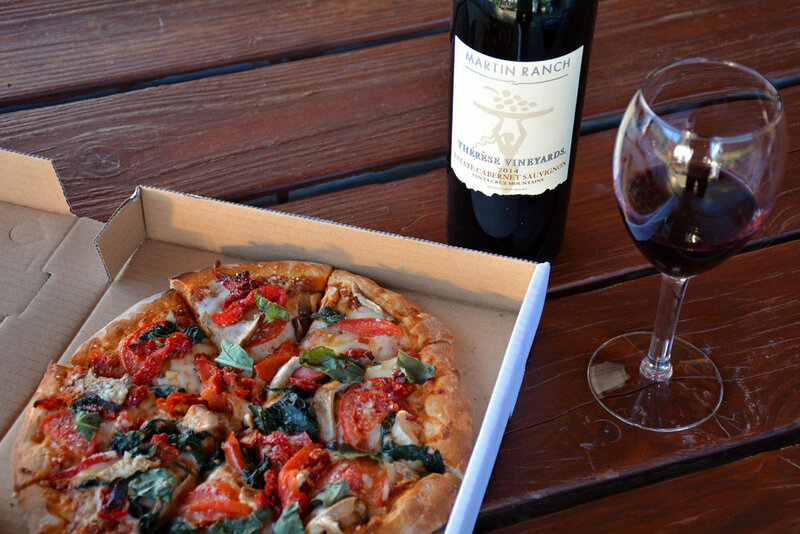 Whether you pack your own picnic or pick up one of the tantalizing wood-fired pizzas crafted on site, here’s advice straight from our MRW crew members for complementing your food with our wine. Winemaker Thérèse Martin reaps the rewards of a plant-based diet that fuels her busy days in the office, vineyard, and barrel room. By using in-season veggies and herbs that she grows in her organic garden, she crafts memorable dishes that highlight the bounty of Martin Ranch. A sure-fire way to beat the heat and ramp up your nutrients after a tasting is to bring your favorite cut vegetables and partner them with creamy hummus or fresh guacamole. Throw in mixed nuts, olives, or grapes and you’ll have a plant-based feast! Complement your veggie nibbles with our refreshing J.D. Hurley Chardonnay, or sip and savor with the fresh berry aromas of our Thérèse Vineyards Pinot Noir from Lester Family Vineyards. In addition to our assorted snack offerings, Chef Lou and his crew from Cellar Door Catering have been whipping up pizzas in our wood-fired pizza oven for guests all summer long. Made to order on Saturday and Sunday open tasting days, our Club Members have been singing the praises of all three options: Meat Trio, Veggie, and Margherita. Our winemaker David Dockendorf says for a show-stopper, look to the region where the cuisine originates and pair with a wine from nearby. Complement Chef Lou’s pizza or other red sauce dishes like pasta and ragout with Thérèse Vineyards Sangiovese for a knockout pairing every time. Who can resist a little sweetness to wrap up their day at the winery? Tasting host Lorrie believes everyone should try our 3-ingredient Paso Almonds Brittle sold near our checkout area. Be warned: once you taste its indulgent crunchy goodness, you’ll keep coming back for more! If you’re after a more delicate flavor, pick up one of the locally-made packages of Roxanne’s Biscotti. Artisanally crafted with old-world ingredients, you won’t be disappointed. Complement either Paso Brittle or Roxanne’s Biscotti with the elegant floral aromas of Thérèse Vineyards Viognier or the rich blackberry of our J.D. Hurley Zinfandel.